While no athlete is ever satisfied with a moral victory, in the early season, they count. Improvement is what teams are looking for in their inaugural bouts, and if it can be found, even in a loss, it can be built upon. Such was the case Tuesday for the Bulldog soccer team in their home opener at the Mack Chase Athletic Complex. The ‘Dogs battled Class 6A Hobbs to what would have been a 0-0 tie at the half save an iffy call that gave the Eagles a penalty kick. As it was, the Artesia boys stayed within a goal until the final 21 minutes of the game, when Hobbs was able to round out the final, 2-0. Jowers was particularly impressed with his squad’s consistency Tuesday. The Eagles outshot the ‘Dogs – who only had two attempts on goal in the contest – by a wide margin, but the boys in orange stepped up and fought to hold them at bay for the biggest part of the game. Hobbs’ penalty kick came at the 29:43 mark in the first half to make it 1-0, and the Eagles logged their second goal at 20:56 in the second. 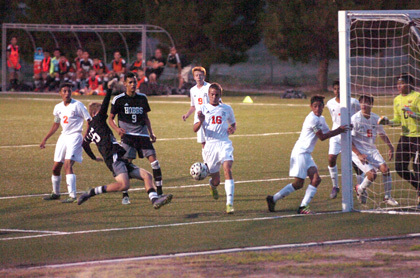 Artesia took both of its shots, including a header off a free kick at 16:14, in the second half. The ‘Dogs were coming off of a close 3-2 loss to Belen Saturday on the road that saw the team struggle in the second 40 in their first game of the year. “It was one of those things where our first half was good and then the second half, we just completely didn’t put it together and play our game,” said Jowers. “We had a couple of just silly goals that we let in that we shouldn’t have allowed. Jake Trejo and Carlos Martinez accounted for Artesia’s goals Saturday. The Bulldogs (0-2) will now have a week off after their game against Valencia, scheduled for Saturday in Los Lunas, was cancelled. They’ll compete again at 6 p.m. Tuesday against Ruidoso on the road. The Lady Bulldog soccer team fell to Hobbs 5-0 Tuesday on the road. Full details will be published in Thursday’s Daily Press.